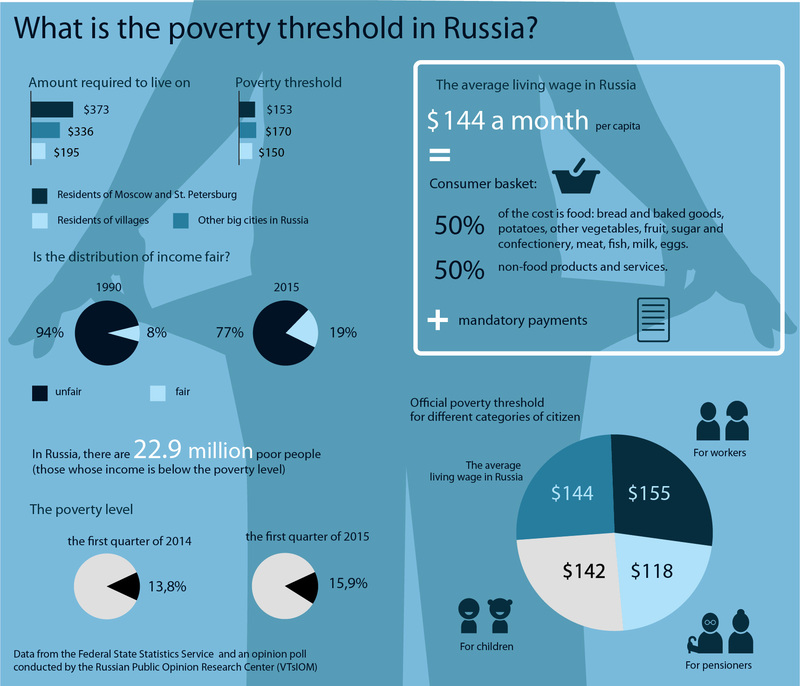 What is the poverty threshold in Russia? Poverty level is the minimum income level necessary for a person to sustain their health and meet their basic needs. The amount is established by the government on a quarterly basis and is based on the statistics of consumer prices for goods and services.The minimum consumer basket in Russia consists of 156 products and services, in the U.S. – 300, France – 250, the U.K. – 350 and Germany – 475.There is a graduation for different social groups – the poverty level for workers, retirees and children depends on the amount of required daily food products, among other things.Apart from the nationwide average poverty level, there are regional values.The highest amounts are found as a rule in the northern regions of Russia. For example, the average poverty level income per capita in the Nenets Autonomous District in the second quarter of 2015 was set at 18,545 rubles ($280). Poverty level is the minimum income level necessary for a person to sustain their health and meet their basic needs. The amount is established by the government on a quarterly basis and is based on the statistics of consumer prices for goods and services. The minimum consumer basket in Russia consists of 156 products and services, in the U.S. – 300, France – 250, the U.K. – 350 and Germany – 475. There is a graduation for different social groups – the poverty level for workers, retirees and children depends on the amount of required daily food products, among other things. Apart from the nationwide average poverty level, there are regional values. The highest amounts are found as a rule in the northern regions of Russia. For example, the average poverty level income per capita in the Nenets Autonomous District in the second quarter of 2015 was set at 18,545 rubles ($280).